FlameShieldä high temperature, heat / chemical resistant PTFE coated fiberglass sleeve with hook & loop closure offers the advantage of a non-asbestos material with a higher temperature range and with excellent resistance to almost all solvents, caustics and acids. The PTFE coated fiberglass sleeve is an excellent wire, cable, hose, pipe and tube protective cover providing insulation value, energy savings and personnel protection. 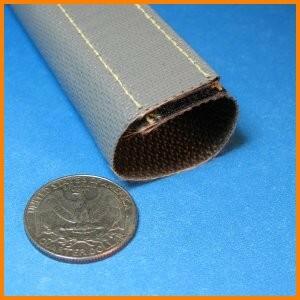 The base fiberglass fabric is rated to 1000°F / 537°C while the PTFE coating melting point is 620°F / 327°C.